This article is about the Malaysian state. For other uses, see Malacca (disambiguation). For similar terms, see Malaka. Malacca (Malay: Melaka; Malayalam: മലാക്കാ; Tamil: மலாக்கா, simplified Chinese: 马六甲; traditional Chinese: 馬六甲; pinyin: Mǎliùjiǎ) dubbed "The Historic State", is a state in Malaysia located in the southern region of the Malay Peninsula, next to the Strait of Malacca. Although it was the location of one of the earliest Malay sultanates, the local monarchy was abolished when the Portuguese conquered it in 1511. The head of state is the Yang di-Pertua Negeri or Governor, rather than a Sultan. Various ethnic customs and traditions blended perfectly in Malacca. Peaceful life of the people of Malacca races due to the life that gave birth to the Malay, Chinese, Indian, Baba and Nyonya, Portuguese, Chitty and Eurasian. Before the arrival of the first Sultan, Malacca was a fishing village inhabited by local inhabitants known as Orang Laut. Malacca was founded by Parameswara, also known as Iskandar Shah. 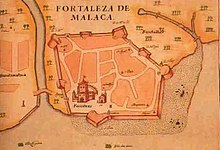 He found his way to Malacca around 1402 where he found a good port—it was accessible in all seasons and on the strategically located narrowest point of the Malacca Straits. 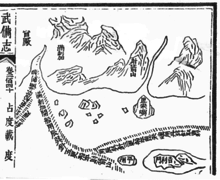 Mao Kun map, from Wubei Zhi, which comes from the early 15th century maps of Zheng He's navigators and cartographers, showing Malacca (滿剌加) near the top left. In Malacca during the early 15th century, Ming China actively sought to develop a commercial hub and a base of operation for their treasure voyages into the Indian Ocean. Malacca had been a relatively insignificant region, not even qualifying as a polity prior to the voyages according to both Ma Huan and Fei Xin, and was a vassal region of Siam. In 1405, the Ming court dispatched Admiral Zheng He with a stone tablet enfeoffing the Western Mountain of Malacca as well as an imperial order elevating the status of the port to a country. The Chinese also established a government depot (官廠) as a fortified cantonment for their soldiers. Ma Huan reported that Siam did not dare to invade Malacca thereafter. The rulers of Malacca, such as Parameswara (白里迷蘇剌) in 1411, would pay tribute to the Chinese emperor in person. In 1431, when a Malaccan representative complained that Siam was obstructing tribute missions to the Ming court, the Xuande Emperor dispatched Zheng He carrying a threatening message for the Siamese king saying "You, king should respect my orders, develop good relations with your neighbours, examine and instruct your subordinates and not act recklessly or aggressively." Because of its strategic location, Malacca was an important stopping point for Zheng He's fleet. To enhance relations, Hang Li Po, according to local folklore, a daughter of the Ming Emperor of China, arrived in Malacca, accompanied by 500 attendants, to marry Sultan Manshur Shah who reigned from 1456 until 1477. Her attendants married locals and settled mostly in Bukit Cina. The Jesuit missionary Francis Xavier spent several months in Malacca in 1545, 1546, and 1549. The Dutch launched several attacks on the Portuguese colony during the first four decades of the seventeenth century. The first attack took place in 1606 under the command of Dutch Admiral Cornelis Matelief de Jonge who laid siege to the town with the help of his Johor allies. He engaged the Portuguese armada which had been sent from Goa to offer armed relief to the besieged port. In 14 January 1641, the Dutch defeated the Portuguese in an effort to capture Malacca, with the help of the Sultan of Johor. The Dutch ruled Malacca from 1641 to 1798 but they were not interested in developing it as a trading centre, placing greater importance on Batavia (Jakarta) on Java as their administrative centre. However they still built their landmark, better known as the Stadthuys. In the Dutch era the building was white, the red paint is of later date. Malacca was ceded to the British in the Anglo-Dutch Treaty of 1824 in exchange for Bencoolen on Sumatra. From 1824 to 1942, Malacca was under the rule of the British, first by the British East India Company and then as a crown colony. Due to dissatisfaction with British jurisdiction over Naning, Dol Said, a local chief, fought the East India Company in a war from 1831 to 1832, which resulted in a decisive British victory. It formed part of the Straits Settlements, together with Singapore and Penang. Malacca went briefly under the rule of Empire of Japan in 1942–1945 during World War II. After the dissolution of this crown colony, Malacca and Penang became part of the Malayan Union on 1 April 1946, which later became the Federation of Malaya in 1 February 1948. The declaration of independence was made by the first Prime Minister of Malaya, Tunku Abdul Rahman, at Padang Pahlawan on 20 February 1956, which eventually led to the independence of Malaya on 31 August 1957. In 16 September 1963, Malaysia was formed with the merger of Malaya with Sabah, Sarawak and Singapore, and Malacca became part of it. On 15 April 1989, Malacca was declared a historical city. It was then also listed as UNESCO World Heritage Site since 7 July 2008. The Malacca River roughly runs through the center line of the state from north to south. Kesang River acts as the eastern border of Melaka with Johor. The offshore Besar Island, Upeh Island and Undan Island are part of Malacca which are accessible by jetty from Malacca mainland. The peninsula of Tanjung Tuan (Cape Rachado) is an exclave of the state, situated on the coast of Negeri Sembilan which it borders to the north. Malacca has several beaches edged with palm trees which has brought a number of resorts along the coast. Beaches include Tanjung Bidara Beach, Klebang Beach, Puteri Beach and Pengkalan Balak Beach. The climate of Malacca is hot and humid throughout the year with rainfall occurring mostly between October and March. Temperature ranges generally between 30-35 °C during daytime and between 27-29 °C during night time. Party composition in the State Legislative Assembly after the 2018 general election: PH (15) and BN (13). The State Government is headed by the Chief Minister. The minister is appointed by Yang di-Pertua Negeri from among the State Legislative Assembly members. The Chief Minister presides over a meeting of State Executive Council ministers weekly at the Chief Minister's office. The Chief Minister's Department is responsible for the overall administration of the state, as well as its political interest. The current Chief Minister is Adly Zahari from the National Trust Party. Despite being located in a land without any significant natural resources, the economy of Malacca dates back more than 500 years, due to its strategic location. As the center of the all important spice trade, Malacca attracted many colonial powers to engage wars to control it. On 20 October 2010 an event was held to announce that Malacca had met the benchmark of 'Developed State' as set out by the Organisation for Economic Co-operation and Development and a declaration of "Melaka Maju 2010" was made. Malacca has successfully opened itself up to foreign investors since the early 1970s. By 1997, the state has registered a total investment of over MYR16 billion. In 2014, the state achieved a total MYR4.4 billion worth of investment, in which MYR1.8 billion came from foreign investors. In 2013, Malacca had a GDP of MYR22,646 million with GDP per capita of MYR34,109. It had 3.2% GDP growth in 2013. Inflation rate in 2012 was 1.6%. As of 2015[update], the Malacca State Government has an outstanding MYR861.7 million of loan to the federal government. In 2014, the state government's reserve amounted to MYR206.61 million. The unemployment rate in 2014 was 0.9% or around 3,500 people. The state has a relatively well-educated population, with a youth literacy rate of 99.5% as reported by Malaysia Millennium Development Goals Report 2015. In 2016, Malacca become the safest place to live in Malaysia. The state crime rates dropped by 15.5 per cent in 2017 with 3,096 cases recorded compared to 3,663 in 2016. Malacca recorded a gross domestic product (GDP) growth of 8.1% in 2017, the second highest in the country after Sabah. Services sector remained the main contributor to the state’s economy at 44.8% of GDP. The GDP per capita also expanded 11.2% to RM46,015 in 2017, surpassing the national-level figure of RM42,228. The State Socioeconomic Report 2017 published on July 26, 2018 reported that Malacca was the state that recorded the lowest unemployment rate in 2017 with only 1.0 percent. Each group upholds their tradition and it is reflected in their food, religion customs, festivals, culture, design, application, jewellery and handicrafts. Among the unique Melaka culture is Dondang Sayang which is recognized by UNESCO. Dondang Sayang is a traditional Malay art still practised in Melaka by four communities: the Malay, Baba Nyonya, Chitty and Portuguese communities. The practice combines elements of music (violins, gongs and tambourines or the tambour), songs and chants, and features melodious strains of poetry. Also known as love ballads, the songs are used by communities to convey feelings of love and give advice on special topics such as love and kindness. For food, Malacca received recognition from the World Street Food Congress for Nyonya Siamese Noodles (34th) and Coolie Street Satay (43rd). The various street dishes and delicacies of Malacca include (but not limited to) satay celup; chicken rice balls; duck noodles; Melaka-style wantan mee; nyonya laksa; pai tee (also known as pie tee and top hats); ayam pongteh; asam pedas with fish; Portuguese grilled fish and seafood; fishball lobak; coconut shake; nyonya cendol; putu piring; and nyonya kuih. Malacca has an estimated population of 931,210 as of 2016[update] with an average annual population growth of 2%. As of 2016[update], 27% of the population aged below 15 years old and 8% aged above 60 years old. The ethnic composition of Malacca as of 2015 is 66.8% Malays (552,700), 1.4% other Bumiputras (11,500), 26.0% Chinese (215,000), 6.2% Indians and Chitty (51,400) and 0.6% others (4,800). Malacca has small communities of Kristang, Dutch Eurasian and Temuan people. Malay community in Malacca is generally divided into two, which are the Temenggong custom and the Perpatih custom. The remaining traditional Malay village in Malacca City is the Morten Village. Jonker Walk is the Chinatown area of Malacca. The Peranakan people in Malacca show unique features, such as furniture, porcelain, crockery, style and food. Their culture is showcased at the Baba Nyonya Heritage Museum. Indians in Malacca are the Tamil people, many of whom used to work at the rubber plantation. However, many of them now work in the jewellery, fabrics, retailers, merchants and money lender sectors. Many of them reside in Little India. There is also Chitty Village for the minority Chitty people which houses the Chitty Museum. A population of Portuguese descent, who speak a Portuguese creole, are the descendants of colonists from the 16th and 17th centuries. Even to this day, many of the traditions originating with the Portuguese occupation are still practised, i.e. "Intrudu" from Portuguese word "Entrudo" (a water festival that marks the beginning of Lent, the Catholic fasting period), "branyu" (traditional dance), "Santa Cruz" (a yearly Festival of street celebrations). Many of them settle down around the Portuguese Settlement area, which has a population of about 1,200 residents. Malacca is a multi-linguistic state. Malaysian is the official language of Malacca and is used in the government and public sectors. English is widely used in the business and tourism sectors. A local Malay, known as Malaccan Malay is a unique variety of Malay spoken within the state of Malacca, it has its own distinct pronunciation and vocabulary compared to the rest of Malaysia. Other minority languages such as Chinese and its varieties, Tamil, Kristang (Portuguese creole) and various Malay-based creoles such as Baba Malay and Malaccan Creole Malay are also spoken. The Orang Asli languages spoken within Malacca are mostly speakers of the Temuan language. According to the 2010 census, the population of Malacca is 66.1% Muslim, 24.2% Buddhist, 5.7% Hindu, 3.0% Christian, 0.4% of unknown affiliation, 0.2% non-religious, 0.2% Taoist or Chinese religion follower, and 0.2% of followers of other religions. 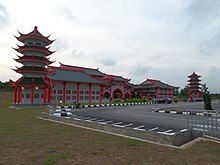 Statistics from the 2010 Census indicate that 91.6% of the Chinese population in Malacca are identified as Buddhists, with significant minorities of adherents identifying as Christians (6.7%), Chinese folk religions (0.7%) and Muslims (0.4%). The majority of the Indian population are Hindus (86.3%), with a significant minorities of numbers identifying as Christians (6.6%), Muslims (3.4%) and Buddhists (2.8%). The non-Malay bumiputera community are predominantly Christians (46.8%), with significant minorities identifying as Muslims (24.2%) and Buddhists (12.0%). As the definition of a "Malay" in the Malaysian constitution requires that the person professes the religion of Islam, all Malays are necessarily Muslims. Up to 2018, there are 237 primary schools and 77 secondary schools in Melaka. Sekolah Jenis Kebangsaan (C) Yok Bin, Sekolah Kebangsaan Convent Of The Infant Jesus (2), Sekolah Kebangsaan (P) Methodist (2) and Sekolah Kebangsaan Convent Of The Infant Jesus (1) is the high performance primary school in Melaka while for secondary school is Sekolah Menengah Sains Muzaffar Syah (MOZAC), Sekolah Berasrama Penuh Integrasi Selandar and Sekolah Menengah Kebangsaan Agama Sharifah Rodziah. The Malacca High School is one of the premier schools in Malaysia and is the second oldest recorded school in the country after Penang Free School in Penang. The Ministry of Education of Malaysia enrolls students based on their Ujian Penilaian Sekolah Rendah (UPSR) and Pentaksiran Tingkatan 3 (PT3). A centre for juvenile convicts, Henry Gurney Prisoners School, is in Telok Mas, Malacca. Established in 1949 as High Moral School, it was renamed to the School of Henry Gurney on May 15, 1950. This centre runs rehabilitation programs for male juvenile offenders. Malacca has three international schools, the Melaka International School, which cater for the local communities; MES and KYS International School, staffed by expatriate teachers, which specialise in teaching Cambridge International A Levels and cater for the expatriate communities. 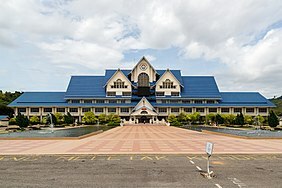 Universiti Teknikal Malaysia Melaka (UTeM). 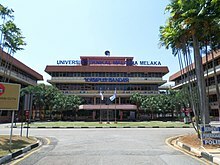 Universiti Teknologi MARA (UiTM) campuses that are located at Lendu, Malacca City and Jasin. Malacca Manipal Medical College in Bukit Baru is the foremost institution for medical education in the state. Multimedia University (MMU) at Bukit Beruang. Malaysian Maritime Academy (ALAM) at Kuala Sungai Baru. Malaysian Academy of Han Studies (MAHANS) at Hang Tuah Jaya. 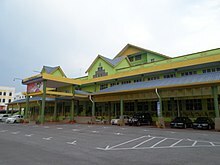 At town and village level, library branches are Masjid Tanah branch established in 1992 and 2005; Air Tawar Village Library, Felda Kemendor Village Library, Selandar Village Library and Kuala Linggi Village Library branches established in 1993; Rantau Panjang Village Library branch established in 1994; Merlimau branch established in 1994 and moved to a new building in 2003; Pulau Sebang Village Library branch established in 1997; Japerun Sungai Rambai Library, Japerun Serkam Library, Japerun Durian Tunggal Library and Ayer Molek Darat Village Library branches established in 1999; Felda Bukti Senggeh Village Library and Felda Bukit Sedanan Village Library branches established in 2000; Kampung Padang Village Cyber Library branch established in 2001; Japerun Air Panas Library, Bertam Hulu Village Library, Japerun Bukit Asahan Library, Tangga Batu Village Library and Paya Rumput Village Library branches established in 2002; Ilmu Air Limau Cyber Library and Ilmu Chenderah Cyber Library branches established in 2003; Menggong Village Library branch established in 2004; Klebang Village Cyber Library established in 2005; Telok Mas Town Library and Telok Gong Village Library established in 2006; Bukit Bulat Village Library established in 2008; Malacca Planetarium Community Library and ÆON Community Library branches established in 2010; Sungai Rambai Village 1Malaysia Library established in 2012. By 2020, the government-run 7,248ha Melaka World Solar Valley aims to power most of the daily activities of manufacturers, housing developers, farmers, and other stakeholders. Recently, a public-private partnership installed 100,000 LED street lamps along the Alor Gajah–Central Melaka–Jasin (AMJ) highway, which will improve road safety and reduce carbon dioxide emissions. Tourism is a booming industry in Malacca. It is a popular travel destinations for Singaporeans during the weekends. Malacca has adopted as its slogan, "Visiting Malacca Means Visiting Malaysia" ("Melawat Melaka Bererti Melawati Malaysia"). There is a tourist map provided by Malacca. In 2017, the state recorded 16.79 million tourist arrivals, the highest number to date. Despite been a small state spanning 1,644 km2, Melaka has been a destination of choice for travellers from China, Singapore, Indonesia, Taiwan and Hong Kong. During the first six months (January–June) 2018, over 8.73 million tourists were recorded visiting Melaka which is over seven percent compared to 8.14 million tourists for the first six months of 2017. It showed an increase of 599,037 tourists. The increase was contributed by the increase of domestic tourists to Melaka which was more than 72,000 or 1.36 percent. For domestic tourists, five states reportedly visited the most are from Selangor, Kuala Lumpur, Johor, Terengganu and Negeri Sembilan. Most of these tourists love to enjoy grilled fish and asam pedas in Malacca. In addition, foreign tourist arrivals also experienced a sharp increase of more than 520,000 or 19.03 percent. Travelers from five countries recorded the highest rates are China, Singapore, Indonesia, South Korea and Vietnam. In recent years, Malacca has received numerous international accolades. The city has been listed by several publications, including Forbes and Lonely Planet, as one of Asia's and World's Top Travel Destinations. Malacca listed as one of 10 Best Destinations in Malaysia by Tripadvisor. Waze App recognized Malacca with 'The Best City to Drive In' Award. Globally, the historic city is ranked ahead of other major metros like Sydney, Lisbon, and Barcelona. The city also has been recognised by HuffPost as 15 of the Best Street Art Cities. In addition, Time publication placed Malacca as one of the best places to live and retire. Penang started the street art trend in Malaysia and Malacca soon followed suit with their River Art Project in 2012. Water has always been a big part of Malacca’s history. It was once one of the world’s most important trading ports, so it also makes sense that Malacca start the street art with the buildings beside the river. To boost the art landscape in Malacca, nine artists came together to paint their works on the walls of historical shophouses along the river in Jalan Kampung Hulu. Known as ProjectARM, these artworks are designed to highlight the beauty of Malacca. The murals depict the artists representation of Malacca and include a colourful mosaic painted on the walls of Kiehl’s store. Malacca has numerous historical places and buildings. In order to preserve those sites, numerous museums have been built to preserve those legacies. Most of the museums in the state are managed by Malacca Museum Corporation (PERZIM; Malay: Perbadanan Muzium Melaka). Museums in Malacca are Aborigines Museum, Agricultural Museum, Malacca Al-Quran Museum, Baba Nyonya Heritage Museum, Beauty Museum, Cheng Ho Cultural Museum, Chitty Museum, Customs Department Museum, Democratic Government Museum, Education Museum, Malacca Forestry Museum, Governor's Museum, History and Ethnography Museum, Malacca Islamic Museum, Malacca Kite Museum, Malacca Literature Museum, Malacca Sultanate Palace Museum, Malay and Islamic World Museum, Malaysia Architecture Museum, Maritime Museum, Navy Museum, People's Museum, Prison Museum, Pulau Besar Museum, Stamp Museum, Straits Chinese Jewellery Museum, Submarine Museum, Toy Museum, Tradition and Custom Museum, UMNO Museum, World's Bees Museum and Youth Museum. There are also galleries displaying various aspects of life in Malacca, which include, Chief Minister’s Gallery, Demang Abdul Ghani Gallery, Folks Art Gallery, Malacca Gallery, Gallery of Admiral Cheng Ho, Macau Gallery, Malacca Art Gallery and Malacca House. Some night markets can be found along Jonker Walk in Chinatown during weekends evening and along Puteri Beach in Tanjung Kling. In total, there are around 87 night markets around Malacca. During the Islamic fasting month, special night markets are opened along many major roads throughout the month. In June 2007, the Casa Cuba was opened at Peringgit. A 1.6-km line of Malacca Monorail was launched in October 2010, served the route along the Malacca River. Due to several technical glitches months into its operation, the system was left idle in 2013. However, in June 2015 the Malacca State Government decided to revive the project. On December 4, 2017, Malacca Monorail has re-operate with enhanced safety features such as lightning-prevention devices and the addition of a rescue vehicle to attract wagons in the event of a technical problem. The previous incident is believed will not recur as tests had been performed for two months before re-operation. The Malacca Monorail operating hours are 10.00 am to 10.00 pm on weekdays and will be continued until 12.00 midnight on Saturdays and Sundays. The Malacca Sentral bus station, combined with taxi terminal, serves cities around Peninsular Malaysia and Singapore. The Panorama Malacca bus is the public bus serving Malacca City and major landmarks. The Ayer Keroh exit at the North–South Expressway is the main entry to Malacca, connected by Ayer Keroh highway to Malacca City. There are two additional exits along the North–South Expressway, namely the Simpang Ampat and Jasin exits. The Syed Abdullah Aziz Road or Malacca Coastal Highway roughly connects the western and eastern sides of Malacca separated by the Malacca River through the Malacca Coastal Bridge. 1987 - Tragic Hero, starring Andy Lau. Part of this Hong Kong movie was filmed in Malacca. 1999 - Entrapment, starring Sean Connery, Catherine Zeta-Jones and Kee Thuan Chye, Malaysian actor. 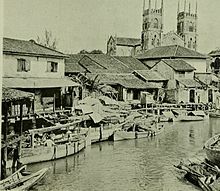 Part of the Hollywood movie was shot at Malacca River. 2001 - One 2 Ka 4, starring Shah Rukh Khan, Juhi Chawla and Jackie Shroff. 2008 - Singaporean drama series The Little Nyonya, starring Jeanette Aw and Qi Yuwu. 2011 - Don 2, starring Shah Rukh Khan and Priyanka Chopra. Malacca Prison were among the filming set of the Bollywood movie. 2013 - Suami Aku Ustaz, starring Ady Putra, Nora Danish and Izzue Islam. The filming is fully carried out at several locations in Malacca. 2016 - Kabali, starring Rajinikanth. Melaka Contingent Police Headquarters, Sungai Udang Prison and somewhere around Melaka towns were among the filming sites of the Kollywood movie. 2016 - Ayda Jebat's Pencuri Hati music video (dangdut version). 2017 - Malaysian drama series Hikayat Cinta Si Pematah Hati, starring Alif Satar. 2018 - Malaysian drama series Mr. Grey, starring Fendi Bakry. Shirley Geok-lin Lim, award-winning novelist, writer and Professor of English at the University of California, Santa Barbara. Suhaimi Sulaiman, news anchor and experienced media strategist in Malaysia. Tan Sri Dato' Sri Ahmad Maarop, seventh and current President of the Court of Appeal of Malaysia. Anuar Zain, singer and a multi award-winning artist. Aubrey Suwito, Malaysian pianist, keyboardist, songwriter, arranger and producer. Resh (Malaysian singer) or Reshmonu, singer-songwriter. Dol Said, 19th-century Malay leader of an area called Naning, which was then part of Malacca on the Malay Peninsula. Ee Tiang Hong, Malayan poet of Chinese ancestry. Hang Jebat, closest companion of the legendary Malaccan hero Hang Tuah. Hang Li Po, fifth wife of Malaccan Sultan Mansur Shah (reigned 1456-1477). Hang Nadim, very young Malay boy of great ingenuity who saved Temasek, now called Singapore, from attack by shoals of a species of swordfish named todak; attacks which cost many indigenous Malays their lives. Hang Tuah, legendary warrior who lived in Malacca during the reign of Sultan Mansur Shah in the 15th century. Munshi Abdullah (Abdullah Abdul Kadir), Malayan writer, was a Malacca-born Indian munshi of Singapore and died in Jeddah, a part of the Ottoman Empire. Panglima Awang (Enrique of Malacca), native of the Malay Archipelago who participated in the Portuguese explorer Ferdinand Magellan's mission in the 16th century to sail around the world. Tan Sri Hajjah Zainon Munshi Sulaiman, historic Malaysian politician, teacher and an independence campaigner. Tun Dato' Sri Tan Cheng Lock, (one of the founding fathers of modern Malaysia and the founder of the Malaysian Chinese Association). Tun Ali of Malacca, fourth bendahara, or prime minister of the Malaccan Sultanate. Tun Perak, fifth bendahara, a Malay rank similar to a prime minister, of the Sultanate of Malacca. Tun Perpatih Putih, sixth bendahara of the Sultanate of Malacca. Tun Mutahir of Malacca, bendahara of the Malaccan Sultanate. Tun Fatimah, well-known Malaysian heroine and daughter of Tun Mutahir the Malaccan bendahara who lived during the 16th century. Betty Chew, wife to Minister of Finance of Malaysia and the previous Chief Minister of the State of Penang, Lim Guan Eng. Chua Tian Chang, Malaysian politician and was the former Member of Parliament for the Batu constituency in Kuala Lumpur, Malaysia from March 2008 to May 2018. Dato' Seri Liow Tiong Lai, former Minister of Transport of Malaysia (2014-2018) and Minister of Health (2008-2013). Datuk Wira Haji Ahmad Hamzah, Malaysian politician and is the Member of the Parliament of Malaysia for the Jasin constituency in the State of Melaka. Devan Nair, Melaka-born third President of Singapore and appointed by Parliament on October 23, 1981. Goh Leong San, Malaysian politician. Kerk Kim Hock, Malaysian politician and the fourth secretary-general for the Democratic Action Party (DAP). Koh Nai Kwong, Malaysian politician of the Malaysian Chinese Association (MCA). Lai Meng Chong, Malaysian politician from the town of Machap Baru in Malacca state. Mas Ermieyati Samsudin, independent member of parliament. Md Sirat Abu, Malaysian politician and a former Member of the Parliament of Malaysia for the Bukit Katil constituency in the state of Melaka. Shamsul Iskandar Md. Akin, Malaysian politician. Tan Siew Sin, son of Tun Dato' Sri Tan Cheng Lock, Malaya's (later Malaysia's) first Minister of Commerce and Industry, Finance Minister for 15 years, and third president of the Malayan Chinese Association (MCA, later Malaysian Chinese Association), a major component party of Alliance and later National Front (BN) coalition. Tan Sri Datuk Seri (DR.) Abu Seman Yusop, Member of the Parliament of Malaysia for the Masjid Tanah constituency in the state of Melaka from 2004 to 2013. Tun Abdullah Mohd Salleh, 5th Chief Secretary to the Government of Malaysia, serving as Chief Secretary from 1 October 1976 to 31 December 1978. Tan Sri Abdul Rahim Thamby Chik, Malacca Chief Minister (1982-1994). Datuk Seri Haji Mohd Zin Abdul Ghani, Malacca Chief Minister (1994-1997). Allahyarham YAB Datuk Seri Abu Zahar Ithnin, Malacca Chief Minister (1997-1999). Tan Sri Haji Mohd Ali Rustam, Malacca Chief Minister (1999-2013). Melaka River Cruise which is also known as Venice of the East was inspired by him. His contribution of ideas also in the construction of Melaka Straits Mosque and Taming Sari Tower. Datuk Seri Utama Ir. Haji Idris Haron, Malacca Chief Minister (2013-2018). He has been leading the project to redevelop Big Island starting with electricity supply to the Big Island and upgrading Sekolah Menengah Agama Dan Tahfiz Al-Quran Pulau Besar Melaka In March 2018, Datuk Seri Utama Ir. Idris Haron has been awarded the Melaka State Sports Icon Award recipient. Haji Adly Zahari, Malacca Chief Minister (2018-). Amirul Hadi, Malaysian professional footballer who plays for Malaysian club Johor Darul Ta'zim II and the Malaysian national team as a central midfielder. Azman Adnan, former Malaysian footballer. Badrul Hisyam Abdul Manap, Malaysian competitive runner. Ching Hong Aik, Malaysian former footballer. Datuk Rabuan Pit, former Asian sprint king. Dollah Salleh, former footballer and football coach. Elena Goh Ling Yin, Malaysian race walker. Farderin Kadir, Malaysian footballer who mainly plays as a striker but can also plays as an attacking midfielder for Melaka United. Goh Liu Ying, Malaysian professional badminton player. Goh Soon Huat, badminton player from Malaysia. Julia Wong Pei Xian, badminton player from Malaysia. Khairul Hafiz Jantan, Malaysian sprinter. Lim Teong Kim, retired Malaysian football player and formerly an assistant coach of Bayern Munich U-19 Team. Mirnawan Nawawi, former field hockey player. Mohd Suffian Abdul Rahman, Malaysian footballer currently playing as a goalkeeper for Terengganu FA. Mohizam Shah Dawood Shah, Malaysian former football player. Norhafiz Zamani Misbah, Malaysian professional footballer who plays as centre-back. Norizam Ali Hassan, Malaysian former footballer who played as striker. Ong Kim Swee, Malaysian football manager and former footballer. Robert Braddell, historic English cricketer. See Kok Luen, Malaysian footballer who currently plays for Selangor United in the Malaysia FAM League. Shukor Adan, Malaysian footballer who is currently playing for Felda United and also serves as their captain. Soh Chin Aun, Malaysian national football player from Malacca alongside the late Mokhtar Dahari and R. Arumugam. YH Dato' Sri Mohamad Norza Zakaria, President of Olympic Council of Malaysia (OCM) and also hold the post of President of Commonwealth Games Association of Malaysia. Abdul Razak Mohd Yusof, police senior officer, martial artist and one of the national heroes from the Royal Malaysia Police 69 Commando of the Pasukan Gerakan Khas. A. Samad Said, novelist and poet. Danny Lim, Malaysian writer, journalist and photographer. ^ "Melaka River - Malacca City Attractions". Malacca.ws. Retrieved 2012-10-29. ^ a b "Laporan Kiraan Permulaan 2010". Jabatan Perangkaan Malaysia. p. 27. Retrieved 24 January 2011. ^ a b c "Melaka Jatuh Ke Tangan Belanda -". hids.arkib.gov.my. ^ a b c Ismail, Mat Rofa (18 August 2018). "Kerdipan Bintang Melayu Dilangit Turki". Alaf 21 – via Google Books. ^ Huaqun, Zeng; John, Wong; Keyuan, Zou (15 March 2006). "China-asean Relations: Economic And Legal Dimensions". World Scientific – via Google Books. ^ "Signing of the Anglo-Dutch Treaty (Treaty of London) of 1824 - Singapore History". eresources.nlb.gov.sg. ^ Singapore, National Library Board,. "Malayan Campaign - Infopedia". eresources.nlb.gov.sg. ^ a b "Penubuhan Malayan Union -". hids.arkib.gov.my. ^ a b "Federation of Malaya is inaugurated - Singapore History". eresources.nlb.gov.sg. ^ a b "Official Portal of Malaysia National Archives". Arkib.gov.my. Retrieved 2018-08-18. ^ a b "Portal Rasmi Arkib Negara Malaysia". www.arkib.gov.my. ^ "Community Involvement for Sustainable World Heritage Sites: The Melaka Case" (PDF). web.usm.my. ^ a b "Making Melaka liveable, resilient, and future-proof". Star2.com. Archived from the original on 2018-11-08. Retrieved 2018-11-18. ^ a b Ricklefs, M.C. (1991). A History of Modern Indonesia Since c.1300, 2nd Edition. London: MacMillan. p. 19. ISBN 0-333-57689-6. ^ "Know your Malacca tree - Nation | The Star Online". www.thestar.com.my. Retrieved 2018-08-19. ^ a b c d e f g Sen, Tansen (2016). "The Impact of Zheng He's Expeditions on Indian Ocean Interactions". Bulletin of the School of Oriental and African Studies. 79 (3): 615. doi:10.1017/S0041977X16001038. ^ Jin, Shaoqing (2005). Office of the People's Government of Fujian Province, ed. Zheng He's voyages down the western seas. Fujian, China: China Intercontinental Press. p. 58. ISBN 978-7-5085-0708-8. Retrieved 2 August 2009. ^ Royal Asiatic Society of Great Britain and Ireland. Straits Branch, Reinhold Rost (1887). Miscellaneous papers relating to Indo-China: reprinted for the Straits Branch of the Royal Asiatic Society from Dalrymple's "Oriental Repertory," and the "Asiatic Researches" and "Journal" of the Asiatic Society of Bengal, Volume 1. LONDON: Trübner & Co. p. 252. Retrieved 9 January 2011. .
^ Ricklefs, M.C. (1991). A History of Modern Indonesia Since c.1300, 2nd Edition. London: MacMillan. p. 23. ISBN 0-333-57689-6. ^ a b Ricklefs, M.C. (1991). A History of Modern Indonesia Since c.1300, 2nd Edition. London: MacMillan. pp. 23–24. ISBN 0-333-57689-6. ^ Borschberg, P. (2015). Journal, Memorials and Letters of Cornelis Matelieff de Jonge. Singapore: NUS Press. pp. 65=74. ISBN 978-9971-69-798-3. ^ Borschberg, P. (2010). The Singapore and Malacca Straits. 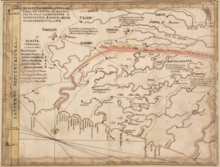 Violence, Security and Diplomacy in the 17th century. Singapore: NUS Press. pp. 157–158. ISBN 978-9971-69-464-7. ^ "Hari Ini Dalam Sejarah". www2.arkib.gov.my. ^ "Elevation of Melaka, Malaysia Elevation Map, Topography, Contour". floodmap.net. Archived from the original on 16 March 2015. ^ "Beautiful beaches and island in Malacca, Malaysia". melaka.net. ^ "Melaka (Federal State, Malaysia) - Population Statistics and Location in Maps and Charts". citypopulation.de. ^ Juli Paul. "Malacca business, the Malacca economy & the booming tourist industry". spy.my. ^ "PETRONAS Penapisan (Melaka) Sdn Bhd". petronas.com.my. 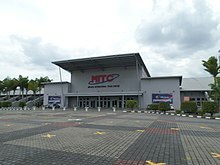 ^ "Melaka International Trade Centre". Archived from the original on 1 July 2015. Retrieved 2015-05-28. ^ "MELAKA MAJU 2010" [PROGRESSIVE MELAKA 2010]. 1KLIK (in Malay). Archived from the original on 2018-11-18. Retrieved 2018-11-18. ^ "Rakyat iktiraf Melaka Maju 2010" [Malaysians recognize Progressive Malacca 2010]. Utusan ONLINE (in Malay). 2018-11-18. Archived from the original on 2018-11-18. ^ Super User. "Economy In Melaka". pknm.gov.my. Archived from the original on 22 June 2015. ^ a b Super User. "E-MELAKA". emelaka.gov.my. Archived from the original on 4 July 2015. ^ "Step up Malacca-China bilateral cooperation to boost economy". www.thesundaily.my. Retrieved 6 May 2017. ^ "Melaka expects RM5.4b in green technology investments by 2020". themalaymailonline.com. ^ a b "Department of Statistics Malaysia Official Website". statistics.gov.my. Archived from the original on 15 June 2015. ^ "Malaysia Milennium Development Goals Report 2015" (PDF). ECONOMIC PLANNING UNIT PRIME MINISTER'S DEPARTMENT MALAYSIA. Archived (PDF) from the original on 2018-11-08. Retrieved 2018-11-18. ^ "Industrial Area". Archived from the original on 13 July 2015. Retrieved 2015-05-26. 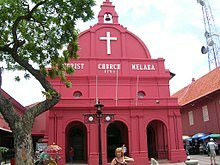 ^ "The historic state and city : Melaka today". melaka.net. ^ "Terengganu second safest place to live in after Malacca". NEW STRAITS TIMES. 2018-11-27. Archived from the original on 2016-02-19. ^ "Kadar jenayah di Melaka turun 15.5 peratus" [Crime rates in Melaka fell by 15.5 percent]. Sinar ONLINE (in Malay). 2018-11-18. Archived from the original on 2018-11-18. Retrieved 2018-11-18. ^ "Melaka posts second-highest GDP growth in Malaysia". FMT news. Archived from the original on 2018-11-30. Retrieved 2018-11-30. ^ "Isu Tenaga Kerja Antara Fokus Exco Melaka G. Saminathan" [Manpower Issue Among Focus by Melaka Exco G. Saminathan]. Bernama.com (in Malay). 2018-11-30. Archived from the original on 2018-11-30. ^ a b "Community In Melaka". melaka.gov.my. ^ "Dondang Sayang". UNESCO. Archived from the original on 2018-12-25. Retrieved 2018-12-25. ^ "Dondang Sayang terima pengiktirafan UNESCO" [Dondang Sayang receives UNESCO recognition] (in Malay). astro AWANI. Archived from the original on 2018-12-25. Retrieved 2018-12-25. ^ "Top 50 World Street Food Masters" (PDF). world street food congress 2017. Archived (PDF) from the original on 2018-11-08. Retrieved 2018-11-18. ^ "15 Malaccan Dishes You Should Try Before You Die". SAYS. Archived from the original on 2018-11-08. Retrieved 2018-11-18. ^ "Fact & Number". melaka.gov.my. Archived from the original on 1 June 2015. ^ "Kebudayaan — Bahasa Melayu" (in Malay). Melaka.gov.my. Retrieved 2018-08-18. ^ "Malacca's most famous Malay village, Kampung Morten, is named after a british-era collector of land revenue". Malaysia Premier Property and Real Estate Portal. ^ Kim, Khoo, Kay (18 August 1979). "Melaka dalam zaman moden". journalarticle.ukm.my. ^ "Culture — English". Melaka.gov.my. Retrieved 2018-08-18. ^ "Sikhs gather from all over the world to celebrate for four days - Community - The Star Online". www.thestar.com.my. ^ In Joseph, C. (2018). Policies and politics in Malaysian education: Education reforms, nationalism and neoliberalism. ^ Rizanizam, A. H. (1 January 2009). "Perkampungan Portugis jadi tarikan". Utusan Malaysia. ^ "Travelling information one should know while in Malaysia". melaka.net. ^ a b "2010 Population and Housing Census of Malaysia" (PDF) (in Malay and English). Department of Statistics, Malaysia. p. 86. Archived from the original (PDF) on 16 January 2013. Retrieved 17 June 2012. ^ "Melaka State Sports Council (MSNM)". melaka.gov.my. ^ Super User. 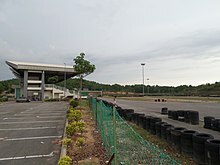 "Hang Tuah Stadium". stadiummelaka.gov.my. Archived from the original on 5 April 2015. ^ Super User. "Profile". stadiummelaka.gov.my. Archived from the original on 26 June 2015. ^ Golfasian (16 December 2013). "Golf Courses in Malacca". malaysiagolfholiday.com. ^ "Bapa lega dapat bantuan TAPEM, MAIM" [Father relieved after TAPEM, MAIM help]. Harian Metro (in Malay). 2018-11-20. Archived from the original on 2018-08-15. ^ "Tabung Amanah Pendidikan Negeri Melaka — English". Melaka.gov.my. Retrieved 2018-08-18. ^ Super User. "Chronology". perpustam.gov.my. ^ "Melaka International Airport". AmazingMelaka.com. Archived from the original on 13 June 2015. ^ "Muzium Melaka akan dibina di China". sinarharian.com.my. 19 March 2015. ^ "Malacca medical tourism hits over 500,000 tourists seeking treatments - Community - The Star Online". thestar.com.my. ^ Administrator. "Company Profile - Powertek Berhad Group". powertek.com.my. ^ "Malacca unveils draft plan for solar valley". themalaymailonline.com. ^ Super User. "Melaka World Solar Valley". melakagreentech.gov.my. ^ Super User. "Latar Belakang". samb.com.my. ^ "RM190m Jernih Dam scheduled to be completed by 2018". thesundaily.my. ^ "Mengambil iktibar daripada pengurusan air Melaka". themalaysianinsider.com. Archived from the original on 19 September 2015. ^ Star Media Group Berhad. "Malacca to start water rationing after Mar 29 if dry spell continues - Nation - The Star Online". thestar.com.my. ^ "Learning efficient water supply management from Malacca". The Rakyat Post. ^ khalid. "RM190 Million Jernih Dam Scheduled To Be Completed By 2018". MyNewsHub. ^ "Understand the 'Don't mess with Melaka' campaign". thesundaily.my. ^ "Melaka State Map" (PDF). www.melaka.gov.my. ^ "Melaka Town Map" (PDF). www.melaka.gov.my. ^ a b "MELAKA". New Straits Times. Archived from the original on 2018-08-14. Retrieved 2018-11-18. ^ "Melaka catat kedatangan lebih 8.73 juta pelancong" [Melaka recorded more than 8.73 million visitors] (in Malay). astro AWANI. Archived from the original on 2018-11-08. Retrieved 2018-11-20. ^ "The 10 Coolest Cities Around the World to Visit in 2018". Forbes. Archived from the original on 2018-02-22. Retrieved 2018-11-18. ^ "Lonely Planet's Best in Asia 2017". lonely planet. Archived from the original on 2018-11-18. Retrieved 2018-11-18. ^ "Top 10 Destinations — Malaysia". tripadvisor MALAYSIA. Archived from the original on 2018-11-18. Retrieved 2018-11-18. ^ "Waze Says This Historic City Is The Best Place To Drive In Malaysia". SAYS. Archived from the original on 2018-11-18. Retrieved 2018-11-18. ^ "15 of the Best Street Art Cities -- an Alternative List". LIFE. Archived from the original on 2018-11-18. Retrieved 2018-11-18. ^ "4 Under-the-Radar Countries Where You Can Retire for Cheap". Money. Archived from the original on 2018-02-20. Retrieved 2018-11-18. ^ "Street Art in Malacca (Melaka)". the Culture Map. Archived from the original on 2018-11-29. Retrieved 2018-11-29. ^ "The Best Mural Artworks in Malaysia". culture trip. Archived from the original on 2018-11-29. Retrieved 2018-11-29. ^ "PERZIM - Background of PERZIM". PERZIM. ^ Super User. "NIGHT MARKET". emelaka.gov.my. Archived from the original on 4 July 2015. ^ "'Tahun ini terlalu mahal'". HM Online. ^ "Melaka information centre will be developed in China, says Idris Haron - Business News - The Star Online". thestar.com.my. ^ "Perasmian Galeri Melaka". dmdi.com.my. Archived from the original on 14 June 2015. ^ Al Amin (22 February 2013). "Ada Galeri Melaka, Jokowi harap turis Malaysia banjiri Jakarta". merdeka.com. ^ "Malaysia Dirikan Galeri Kebudayaan di Jakarta - Tempo Metro". Tempo. ^ Kompas Cyber Media. "Melawat Melaka Lewat Galeri Melaka". KOMPAS.com. ^ "At A Glance [TwinCities 2017]". Melaka Historic City Council. Archived from the original on 31 December 2017. Retrieved 28 July 2018. ^ "MBMB MUO With Twin Cities". Melaka Historic City Council. Archived from the original on 17 September 2017. Retrieved 28 July 2018. ^ a b "New Sunday Times - Google News Archive Search". news.google.com. ^ "Wayback Machine" (PDF). 25 September 2015. Archived from the original (PDF) on 2015-09-25. ^ a b "News" (PDF). library.perdana.org.my. 1992. ^ "MDDP - In the Press =- Malacca, a Dutch conquest forgotten". 25 September 2015. Archived from the original on 2015-09-25. ^ "Portal - Anniversary of the twinning of the Cities of Melaka and Valparaiso - Year 2007". Kln.gov.my. Retrieved 2018-08-18. ^ "Portal - Melaka is keen to get Valparaiso's help - Year 2007". www.kln.gov.my. ^ "Penerbangan khas Nanjing-Melaka guna LTAM". Utusan Online. ^ a b "PressReader.com - Connecting People Through News". www.pressreader.com. ^ "Melaka jalin hubungan dengan wilayah Jiangsu". Utusan Online. ^ a b c kamarul (11 May 2016). "MBMB MUO With Twin Cities". ^ wiguna, surya. "sawahlunto malaka". ^ "Twincities". 31 December 2017. Archived from the original on 2017-12-31. ^ "Melaka, Kembaran Kota Tua Jakarta di Malaysia". ^ a b "Melaka mahu buka semula laluan penerbangan domestik, antarabangsa di LTAM - Astro Awani". www.astroawani.com. ^ "Komuter guna jadual baru mulai esok". 2 February 2018. ^ "Malacca wants to revive monorail line to promote river". AsiaOne. ^ "Lebih 17,000 guna Monorel Melaka sejak beroperasi semula". 3 February 2018. ^ "Kos taman tema, naik taraf kawasan monorel Melaka RM109 juta - Astro Awani". www.astroawani.com. ^ "Monorel Melaka beroperasi semula esok - The Malaysian Insight". www.themalaysianinsight.com. ^ "Ferries to Malaysia-ferries from Indonesia". Tourist Attractions in Malaysia. ^ "Malaysia Truly Asia - Tourism Travel Information Guide: Merlimau Pantai Jetty - Jetty Nelayan Merlimau Pantai". songketmail.org. ^ "Longer runway and international port for Malacca". Free Malaysia Today. ^ "Routes & Schedules - Panorama Melaka". panoramamelaka.com.my. 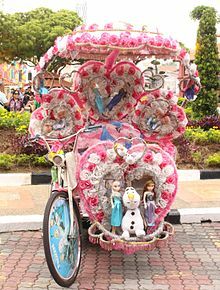 ^ "Trishaw or Beca rides in Malacca town". yinteing.com. ^ "Malaysia syurga penggambaran" [Malaysia is paradise of filming]. Kosmo! Online (in Malay). 2018-11-19. Archived from the original on 2018-07-28. ^ "Tragic Hero (1987)". RETRO JUNK. Archived from the original on 2018-11-19. Retrieved 2018-11-19. ^ "7 Hollywood Movies Filmed in Malaysia". ExpatGo. Archived from the original on 2018-11-19. Retrieved 2018-11-19. ^ "Shah Rukh Khan terima pingat Datuk" [Shah Rukh Khan accepts Datukship]. Kosmo! Online (in Malay). 2018-11-19. Archived from the original on 2018-11-19. ^ "Big Little Nyonya". THE Star ONLINE. 2018-11-19. Archived from the original on 2018-11-19. ^ "10 Movies You Didn't Know Were Filmed In Malaysia. Spot The Bas Sekolah!". SAYS. Archived from the original on 2018-11-19. Retrieved 2018-11-19. ^ "Nora Danish: 'Suami aku ustaz'" ['My husband is an ustaz']. Sinar ONLINE (in Malay). 2018-11-19. Archived from the original on 2018-11-19. ^ "Exco Melaka, wartawan teruja jumpa sendiri Rajinikanth" [Melaka exco, journalist excitedly met Rajinikanth himself]. PROJEK mm (in Malay). Archived from the original on 2018-11-19. Retrieved 2018-11-19. ^ "Ayda Jebat Tampil Dengan Telefon Edisi Istimewa" [Ayda Jebat Appear With Special Edition Phone]. COSMOPOLITAN (in Malay). Archived from the original on 2018-11-19. Retrieved 2018-11-19. ^ "Memang penat tapi berbaloi" [It is tiring but worth it]. Harian Metro (in Malay). 2018-11-19. Archived from the original on 2018-11-19. ^ "Belajar Bahasa Isyarat, Ayda Jebat Menangis" [Learn Sign Language, Ayda Jebat Cries]. GEMPAK (in Malay). Archived from the original on 2018-11-19. Retrieved 2018-11-19. ^ "Fendy berubat kampung sakit misteri" [Fendy use traditional medicine to treat his mystery illness]. my Metro (in Malay). 2018-11-19. Archived from the original on 2018-11-19. ^ Singapore, National Library Board,. "Purbawara Panglima Awang - BookSG - National Library Board, Singapore". eresources.nlb.gov.sg. Retrieved 2018-07-30. ^ "Melaka's appeal lies in its colourful past". AsiaOne. Retrieved 2018-07-27. ^ "Sungai Melaka ibarat Venice of The East". Utusan Online. Retrieved 2018-07-27. ^ User, Super. "MELAKA RIVER CRUISE". www.ppspm.gov.my. Retrieved 2018-07-27. ^ "Sg Melaka — money spinner for heritage city". BorneoPost Online | Borneo , Malaysia, Sarawak Daily News. 2010-10-02. Retrieved 2018-07-27. ^ "Masjid Selat Melaka (Malacca Straits Mosque)". Islamic Tourism Centre. Retrieved 2018-07-28. ^ BAKAR, SUFFIAN ABU. "Masjid Selat Melaka tumpuan pelancong". Utusan Online. Retrieved 2018-07-28. ^ "Rosak: Taming Sari jawab PAS" (in Malay). 2008-11-04. Retrieved 2018-07-28. ^ BAKAR, SUFFIAN ABU. "Penduduk Pulau Besar terima manfaat". ^ "Datuk Seri Utama Ir. Idris Haron Dinobat Ikon Pembangunan Sukan Negeri Melaka". ^ "PREVIU PIALA FAM 2018 YANG BERMULA AHAD, 25 FEBRUARI 2018 - FAM". www.fam.org.my. ^ "Kelab Penyokong Selangor United". www.facebook.com. ^ "Photo" (JPG). pbms.com.my. 2018.